KDC is concerned with the holistic reality of the regional economy and the critical contributions of agriculture to regional food security, economic prosperity and environmental sustainability. Much of KDC’s work involves clients in the local food system. This connects the rural and urban parts of our economy. 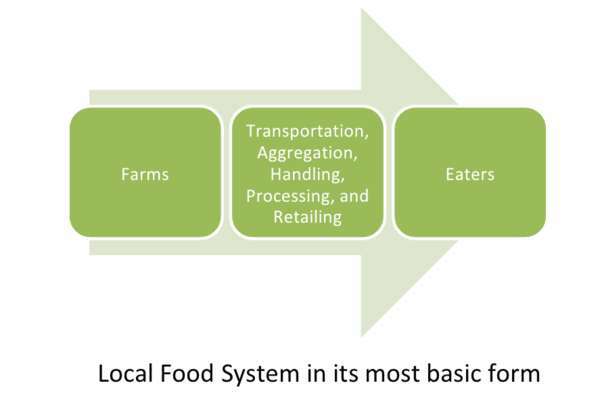 The concept of a foodshed is important to understand when considering the local food system and the rural/urban connection. The term “foodshed” was first introduced by permaculturist Arthur Gets (1991) and leverages the notion of a watershed. A watershed or drainage basis is where surface water from rain and melting snow or ice converges to a single point, usually the exit of the basin, where the waters join another water body, such as a river, lake, reservoir, estuary, wetland, sea, or ocean. A foodshed is a metaphor for the geographical pattern food makes as it travels through marketing channels flowing into a specified location. A foodshed is a theoretical construct with several dimensions including the distance between, a farmer's field and your dinner plate; the amount of processing in between, and structure of the marketing channel through which it flows. Locavores have taken the concept of the foodshed into reality by striving to eat things produced within a 100 mile radius of their foodshed epicenter. This effort is described at www.locavores.com. Local food is food that is grown within a reasonable distance from where it is eaten. Exactly how the “local” is defined varies with the consumers that buy it. The commonality amongst local food consumers is a commitment to purchase food that ensures social, economic, and environmental sustainability. Buying local food reduces the number of "food miles" between farm and plate, and helps to keep agricultural profits in the local economy. By decreasing the amount of fuel used to move food around, this proximity to food sources increases the environmental sustainability of the system. Farms are spread over considerable geography and products from individual farms are difficult and expensive to source. If several farms aggregate product, the inefficiencies can be decreased. Within the local food system, between the farmers and eaters, are hundreds of entities providing the services needed to transform the product after leaving the farm gate to the food that goes onto the customer’s plate. Food takes a myriad of paths on its way to the eater. Some farms do their own boxing and aggregating, delivering directly to customers. Other small-scale food processing companies provide infrastructure and technical expertise. Much of the food in the MidAtlantic foodshed is processed in some way and because much of it has a relatively short growing season, the use of canned, frozen and stored fruits and vegetables is essential to extending the availability. Retailing is an important part of the middle ground. Retailers are the first point of contact for foodshed residents sourcing local foods. Food Cooperatives are an important example of local food retailing, as are farmer’s markets, regular grocery stores, corner markets, and even restaurants. On the other end of the marketing channel from farmers are the eaters. A successful food system must have both a supply and demand for the product. Food cooperatives provide an important source of customers for local farms. Niche markets in the food shed are important to understand. These have significant amounts of food sales but the overall scale is still relatively small. Community Supported Agriculture (CSA) is a significant niche market. The CSA is where a group of people buy shares into the eventual harvest of a farm before the crops are planted. In exchange for their investment into the farm, shareholders receive fresh fruits and vegetables (and sometimes, other products such as local cheeses, fresh flowers, eggs and meats), on a weekly basis throughout the harvest season. By making this investment, CSA members accept part of the financial risks associated with farming. Further, the farmer receives a portion of the cost of production at a time when it is most needed. Many CSA farmers also market through local farmers' markets which can increase farm profitability and stability. Community and school gardens are recognized as an important source of fresh produce, particularly for underserved populations in low-income neighborhoods thereby increasing dietary quality and food security. They provide spaces for community interaction, decision-making, problem-solving, creativity and celebration. Community gardens also provide opportunities to learn about food production, develop job skills, increase agriculture literacy, generate food-related businesses, and create links to nearby restaurants and soup kitchens. U-Pick operations and roadside farm stands provide access to fresh produce direct from the farmer who grew it. Through a U-Pick, the price paid to the farmer is reduced substantially in exchange for harvest labor. In the process, eaters come in contact with farmers, experience another aspect of the food system, and increase their intake of fresh local produce. Community kitchens are facilities where locally produced, gleaned or recovered foods can be further processed or preserved for members of a community. Food product development often takes place at these facilities, thereby creating income generating opportunities and products with local identity. Cooperatives have important roles in the local food system. Agricultural Marketing Cooperatives help farmers to market and distribute their product while Food Cooperatives provide retailing outlets. KDC is helping to development and maintain many food cooperatives in the area, and are supporting the cooperatives in federated efforts; one example is the MidAtlantic Alliance of Cooperatives (LINK). There are economies of scale to be gained, especially with respect to sourcing and transporting local food from the farm into the stores and buying clubs. From a purely urban perspective, KDC has been supporting the development of the Philadelphia Area Cooperative Alliance is a newly formed organization helping all types of cooperatives in the greater Philadelphia area. Leaders of established cooperatives have come together in an alliance to identify ways to work together and create greater efficiencies through cooperation. Since our principal funding source is the Rural Cooperative Development Grant (RCDG), the distinction between rural and urban is important. Eligibility restrictions that follow the RCDG apply to much of what we do. The RCDG must benefit rural populations. For the purposes of the RCDG grant, the definition of rural is any area other than a city or town that has a population of greater than 50,000 inhabitants.